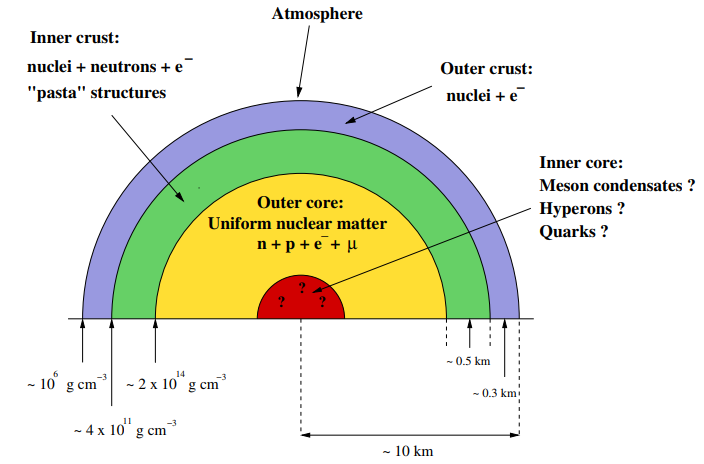 A schematic cross section of a neutron star illustrating the various regions discussed in the text. The different regions shown are not drawn on scale. In this work we shortly review several aspects of the physics of neutron stars. After the introduction we present a brief historical overview of the idea of neutron stars as well as of the theoretical and observational developments that followed it from the mid 1930s to the present. Then, we review few aspects of their observation discussing, in particular, the different types of telescopes that are used, the many astrophysical manifestations of these objects, and several observables such as masses, radii or gravitational waves. Finally, we briefly summarize some of theoretical issues like their composition, structure equations, equation of state, and neutrino emission and cooling. This entry was posted in ASTROPHYSICS, High Energy Physics, NUCLEAR PHYSICS. Bookmark the permalink.